On occasion, especially on a colder day, you might find that you just can’t get your radiators to heat up enough, even though your thermostat is turned up as far as it goes. You might find that the lower half of the radiator is hot, but the top remains frustratingly tepid, or even cold. This usually means that trapped air is locked in the top part. The only way to extract this air and allow hot water to flow freely is to bleed the radiator. Here we’ve provided a step-by-step guide for how to do this. It’s relatively straightforward, should take no more than an hour, and only requires tools that you’ll find at home. But if you feel uncomfortable with DIY, or suspect a wider problem with your system, it’s never a bad idea to call out an engineer to check things over and give your central heating a clean bill of health. Be sure to check for any serious problems before you grab your radiator key. These problems aren’t usually dangerous but may indicate that you need an engineer to look at your boiler and potentially recommend further action such as a repair or replacement. 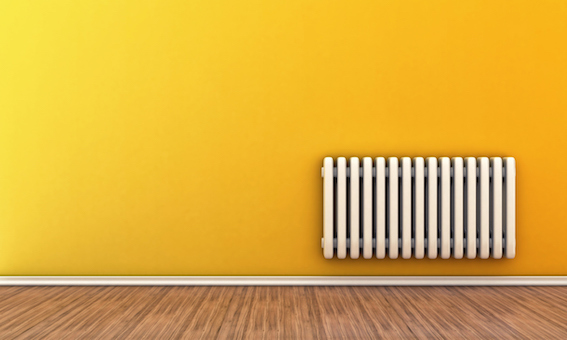 Have a look at the other radiators in your property - are they cold as well? This could be an indication of an issue throughout the whole system. For example, dirt and limescale, or other types of ‘sludge’, can block the flow of warm water through your house. A system flush can resolve this - a Gas Safe engineer can carry this out using cleansing chemicals, and it can extend the lifespan of your boiler itself and overall heating system. You may find that only ground floor radiators are heating up, but those on higher levels are not. This could mean your water pressure isn’t high enough. Have a look at your boiler’s pressure gauge and check it’s in the right range - consult your boiler manual for more information on this. There might be a leak in your radiator. Some obvious signs include damp carpets or pools of water around the radiator and nearby pipes. This could be the result of loose valve nuts on your radiator’s input valve. These can usually be tightened with a spanner, or even replaced if you feel comfortable swapping them. If you’re not sure, an engineer can help. Ideally you’ll need to bleed all your radiators in one go, especially if you have the same type and age of radiator in other rooms. Even if you have different types of radiator, it’s worth doing them all, and you may need different tools for each. Check around for radiator keys - they’re small, metal and generally have a square end. (A lot of people keep them in a top drawer or on the window ledge nearby). You might also want to have a spanner handy. Finally, make sure you have a bowl or tray, and a towel - there will definitely be some water coming out so you’ll want to avoid a mess. Power down your heating, and let the system cool down. This makes sure the air is static and can be released more easily - and ensures you don’t get sprayed with hot water! You’ll need to open both the intake and exit valves on your radiator. If you have thermostatic radiator valves, this means setting them to the highest number. For standard valves, just make sure they are in their usual position that lets the radiator heat up. To open the bleed valve, insert your radiator key (or other tool) and twist anti-clockwise. The valve will make a hissing sound when it opens as air is released, and water flows into the space. Even if there’s a lot of air to release, some water will spit out of the bleed valve, so make sure you have a tray and towel to clean up with. When the water starts becoming a steady stream, it’s a sign that the air has been released. Re-tighten the bleed valve and clean up any excess water. Be sure to check for no additional leaks. Carry out the same process for all the radiators in your home - the aim is to release all the air in the system. To keep your system healthy you should bleed your radiators on a regular basis - once a year is usually enough. If you have any maintenance or repairs, it’s worth carrying out a bleed afterwards to make sure everything is working as it should for a fresh start. The release of all that air from your system will probably affect your system’s pressure, so to keep the flow of hot water around your house you might need to adjust your boiler pressure. Your manufacturer’s boiler manual should explain how to do this, but as a general guide, the needle on your pressure gauge should be between 1 and 1.5. If you discover any further problems when bleeding your radiators, or this guide doesn’t give the results you expect, feel free to call out a gas engineer to take a look, or drop us a line on 0808 169 6484. Which type of boiler do I need? If you'd like to just talk to someone, leave your details here and a friendly heating expert will be in touch to answer your questions and guide you. If you'd like to hear more from hiber in future about recommendations, offers and promotions, please check this box. © 2018 hiber Energy Limited. All rights reserved. Registered in England & Wales company No. 11228917 VAT No. 292336688.